It's that time again! The weather is on the up and a sewer's thoughts turn to dress making. Me Made May starts tomorrow so there's still time to make your pledge at So Zo Don't You Know where Zoe is your delightful host. She explains everything you need to know about pledging. The emphasis is on making a pledge that is suitable for you. I didn't quite know what to pledge. I usually where me made clothes most of the time, I buy very little commercially made clothing and every month I add something to my wardrobe that I have sewn. 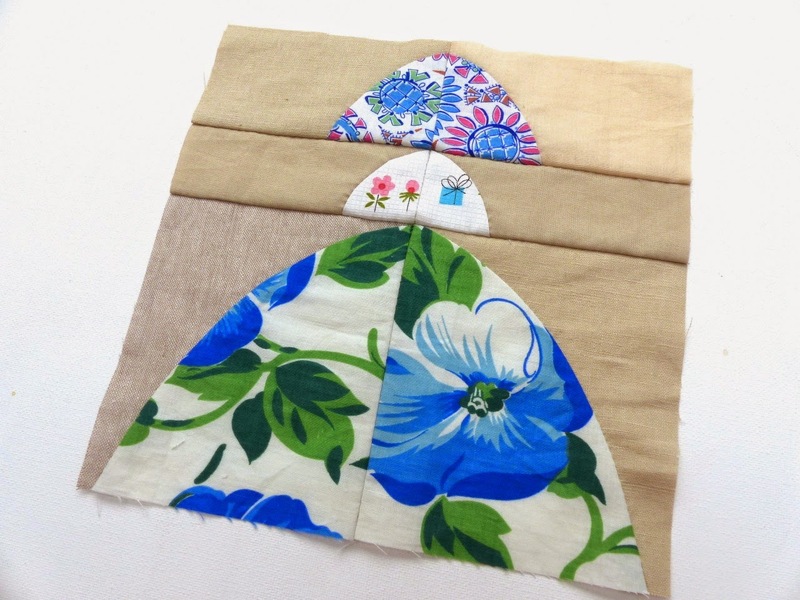 Fundamentally, I look forward to this month as a celebration and inspiration of garment sewing as well as a chance to make new connections and friendships via the hash tag #mmmay15 on Instagram. 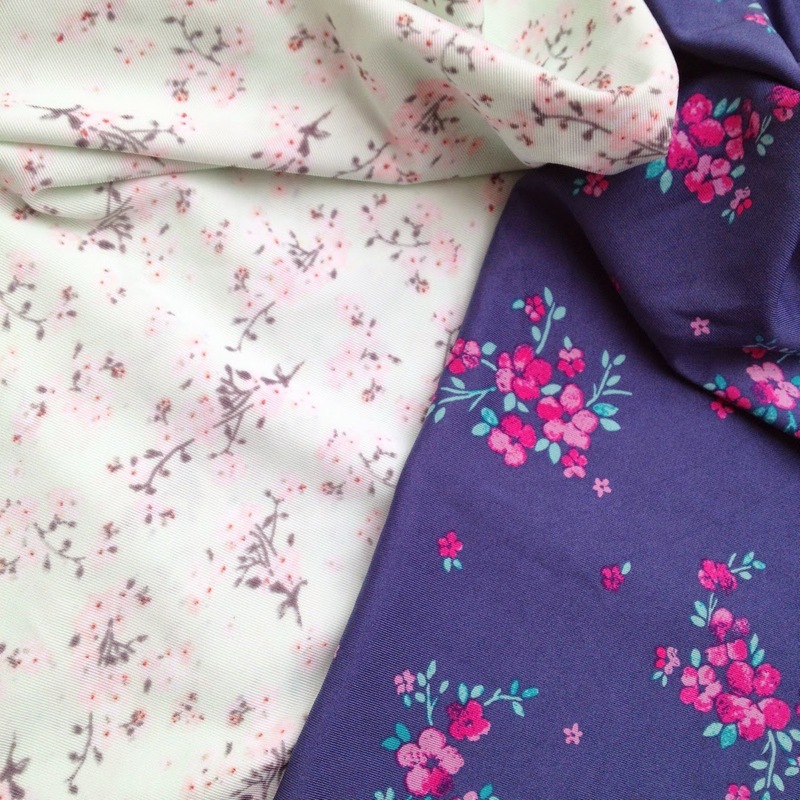 Here are some of my plans- not all for May, just for optimistic Spring and Summer sewing in an ideal world. As my Grandpa used to say when I was a child, my eyes are bigger than my belly. 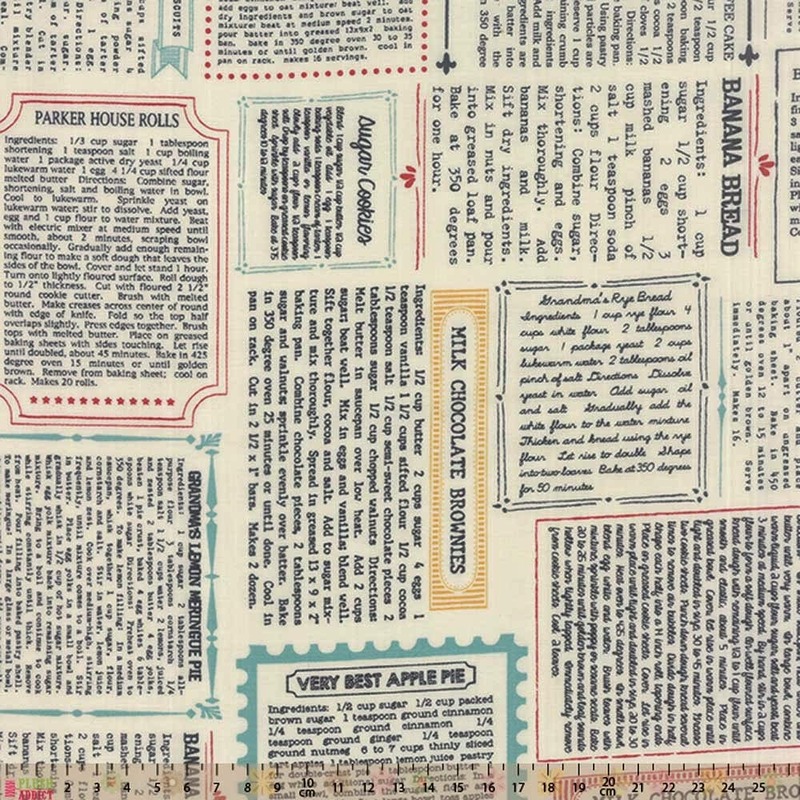 On a recent visit to Preston to see relatives, I found some wonderful fabric at the Flag market from a trader who I have bought from many times over the years. Everything I bought was £7/metre or less. 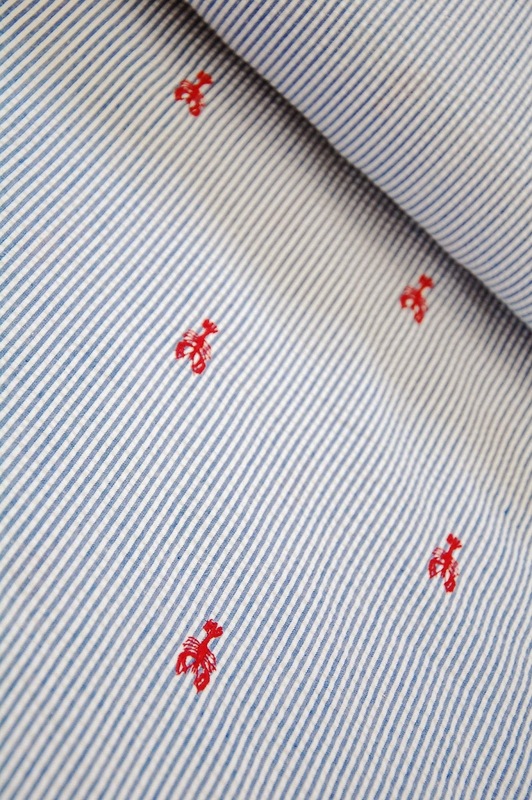 His fabrics are famous names- Ralph Lauren, Liberty, great quality and bargain prices. 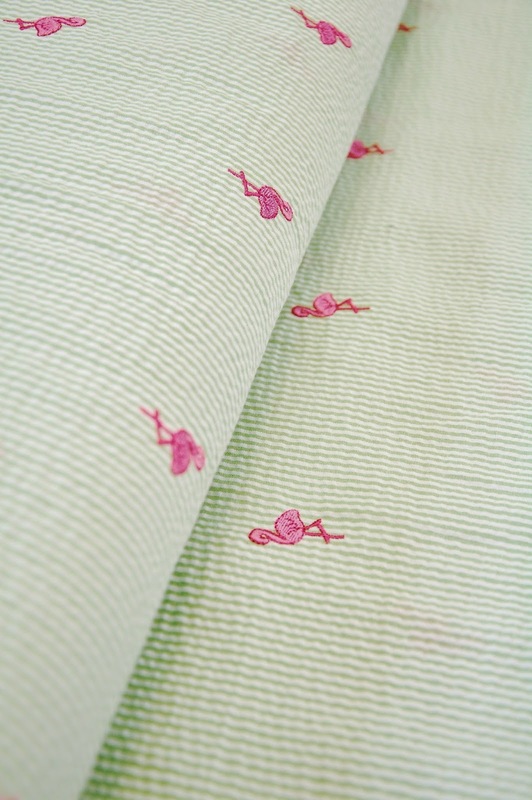 Above, Ralph Lauren pink floral linen/cotton. The blue denim was an ebay bargain. 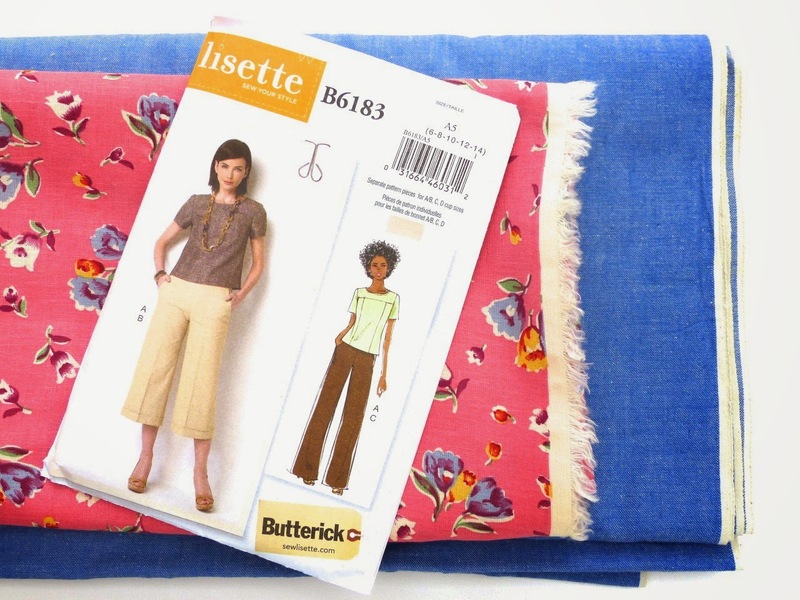 Possible plans for these include some 1970s style wide leg trousers with white top stitching and a semi fitted top, by Liesl Gibson for Butterick B6183. 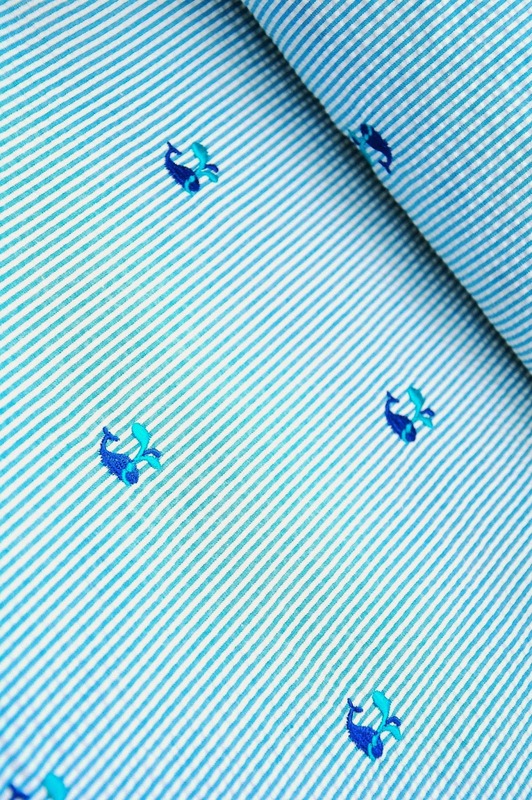 This beauty is another rumoured-to-be Ralph Lauren linen/cotton. 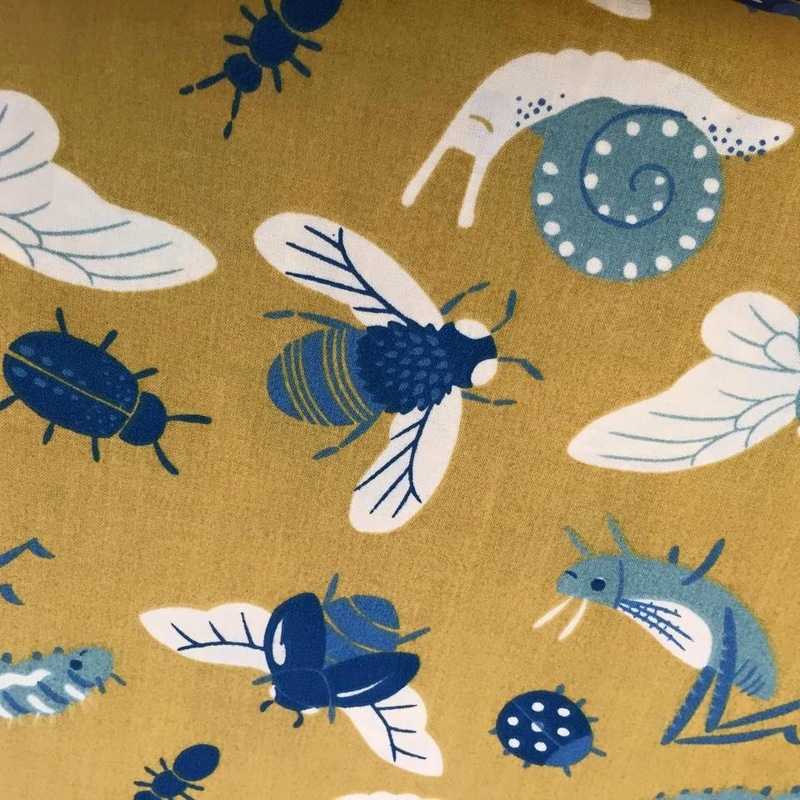 I've seen this fabric on a few garment sewer Instagram pics and I could not resist it. I bought 3 metres at a ridiculously good price and if there had been more money in my purse, I'd have bought the bolt. The quality is excellent. 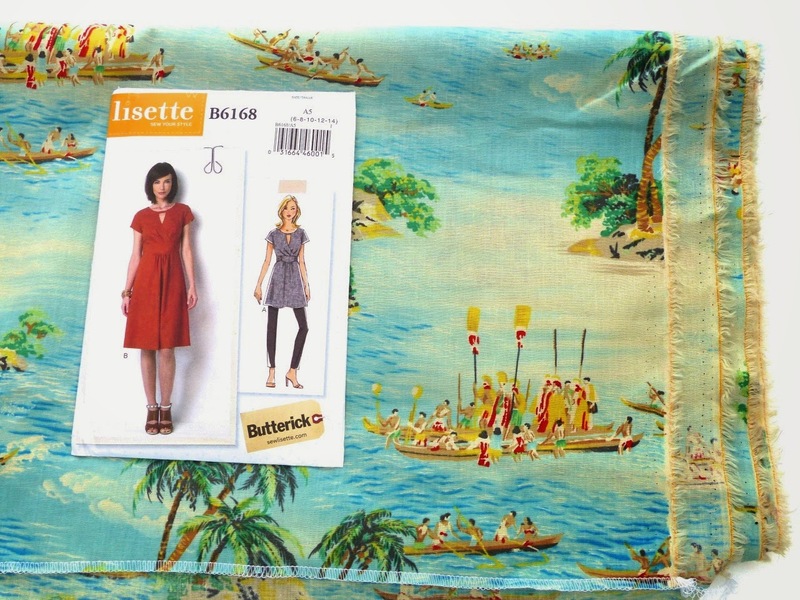 I plan to make the Lisette dress, B6168, but maxi length. 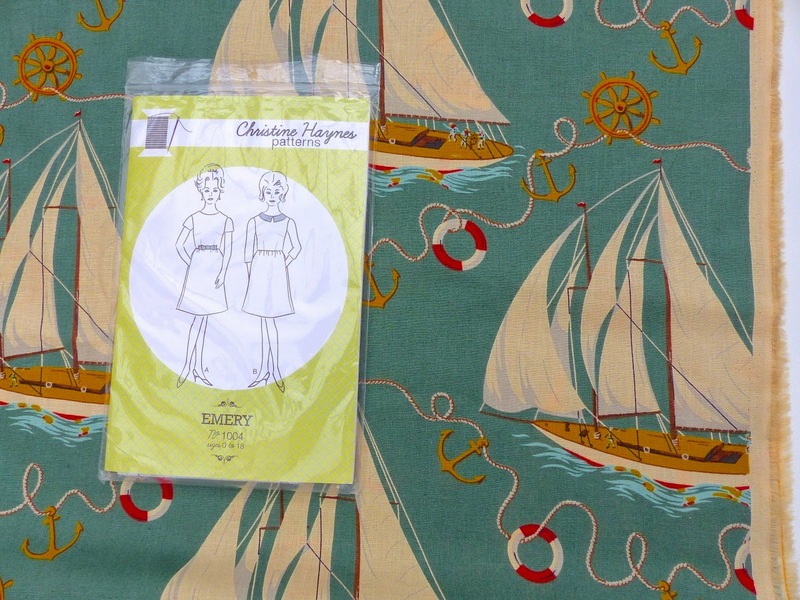 And finally this generous nautical print (which I can't find on the ebay store, guessing it has sold out) Another linen/cotton. With the scale of this print I wanted a simple dress without cut outs on the bodice so Christine Hayne's Emery dress is perfect. I might make the skirt very full for this one. The fabrics can also be found on ebay but the prices are higher to allow for ebay charges/paypal I guess. Everything I've bought from this seller has been excellent. On the stall there was also a large range Liberty seconds in lawn, poplin, cotton/silk, cotton/wool, jersey and a lycra swimwear style blend. If you are in Preston, I recommend the Flag market just for this stall if nothing else- I was there on a Wednesday.
" 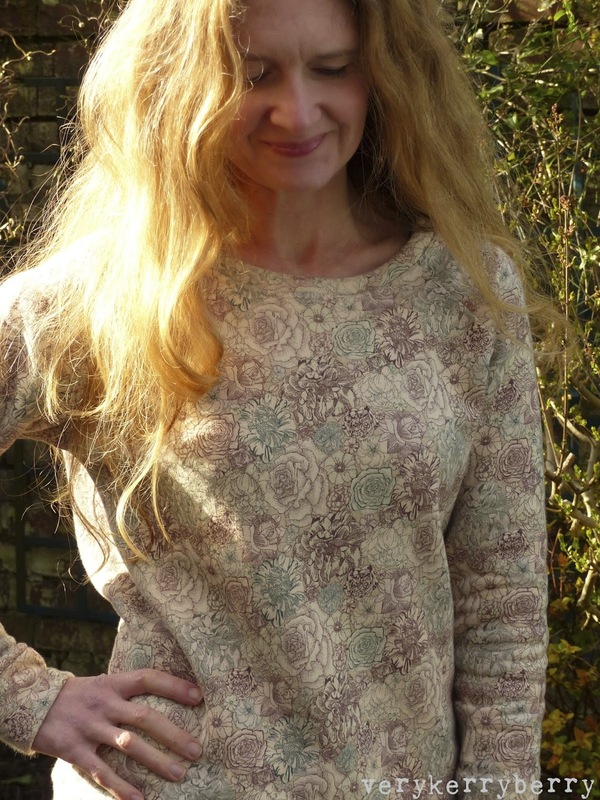 I, Kerry Green from verykerryberry.blogspot.co.uk, sign up as a participant of Me-Made-May 2015. 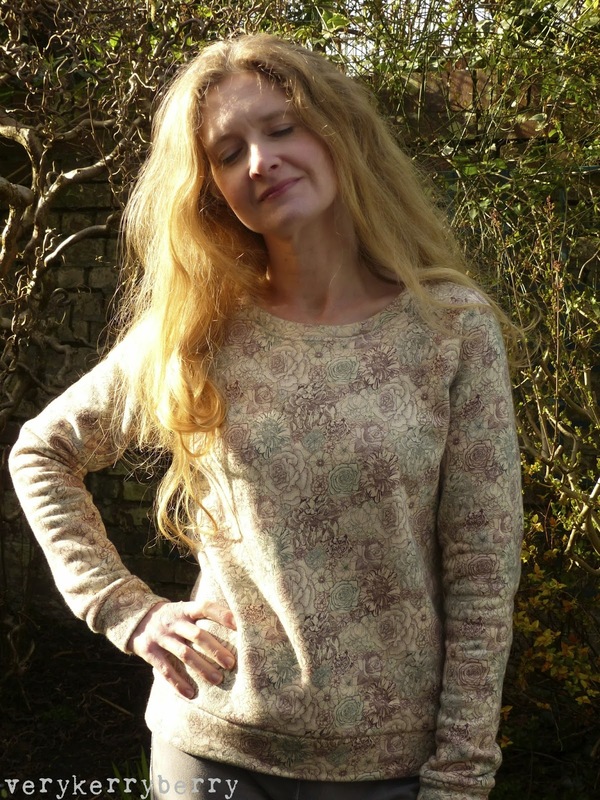 I will endeavour to wear one or more me-made item each day for the duration of May and to sew any new garments from existing stash fabrics and patterns." More than anything I plan to enjoy it. Post outfit pics as and when I feel like it on IG and enjoy seeing what everyone else gets up to. The Friday themes that come via the Flickr group are always fun. 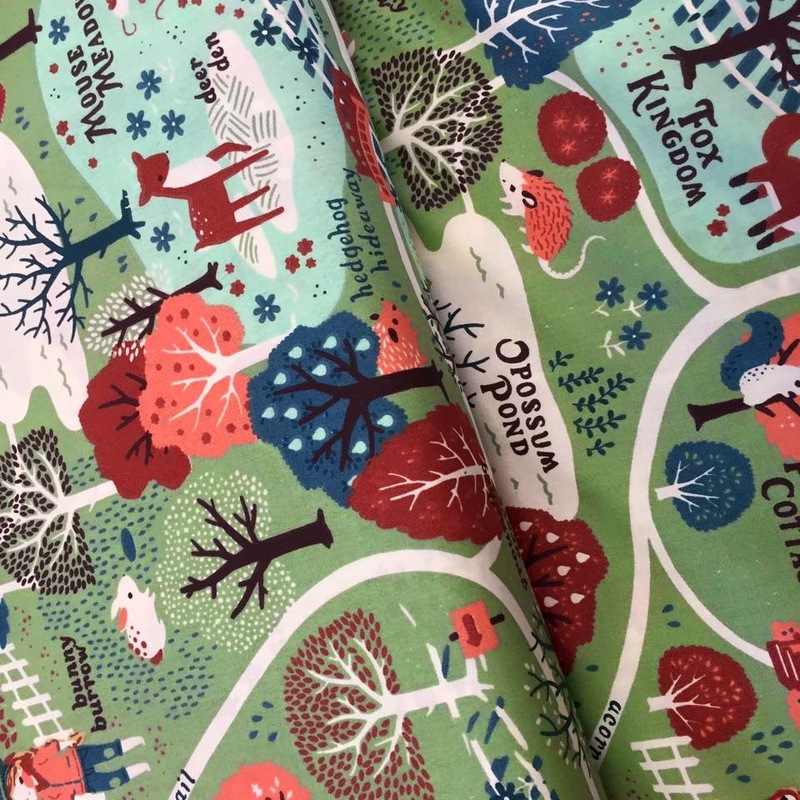 It's time for my April visit to Eternal Maker and I'm starting with some of their newest arrivals First up is Acorn Trail by Teagan White for Birch fabrics. 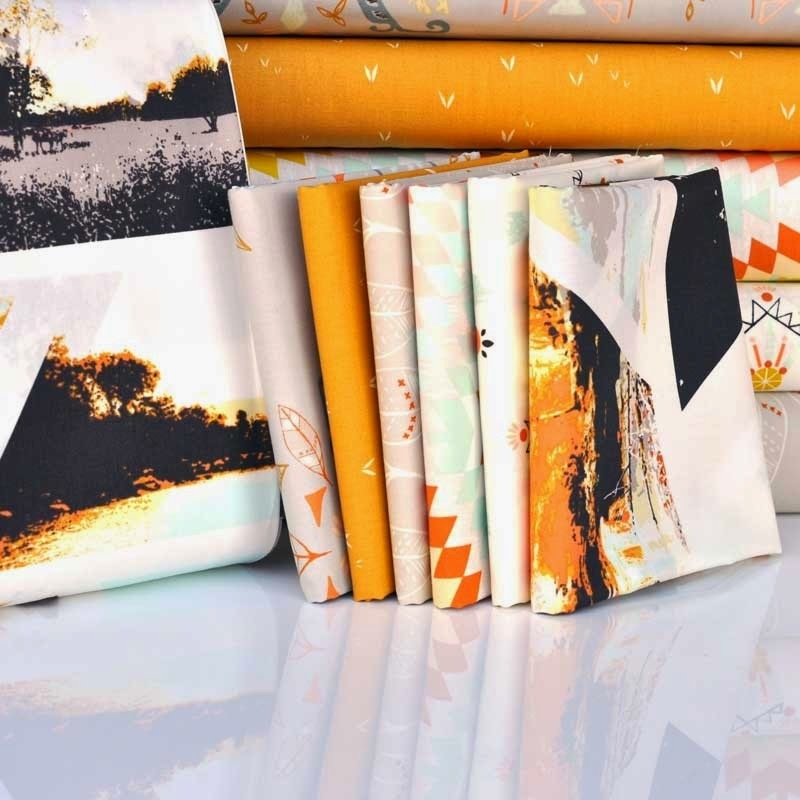 This is a nature themed range, all on organic cotton- Birch fabrics are beautiful quality. I love the colour palette and there is a great balance of feature prints and tonal fabrics. It's a strong collection and lots of the fabrics appealed to me. 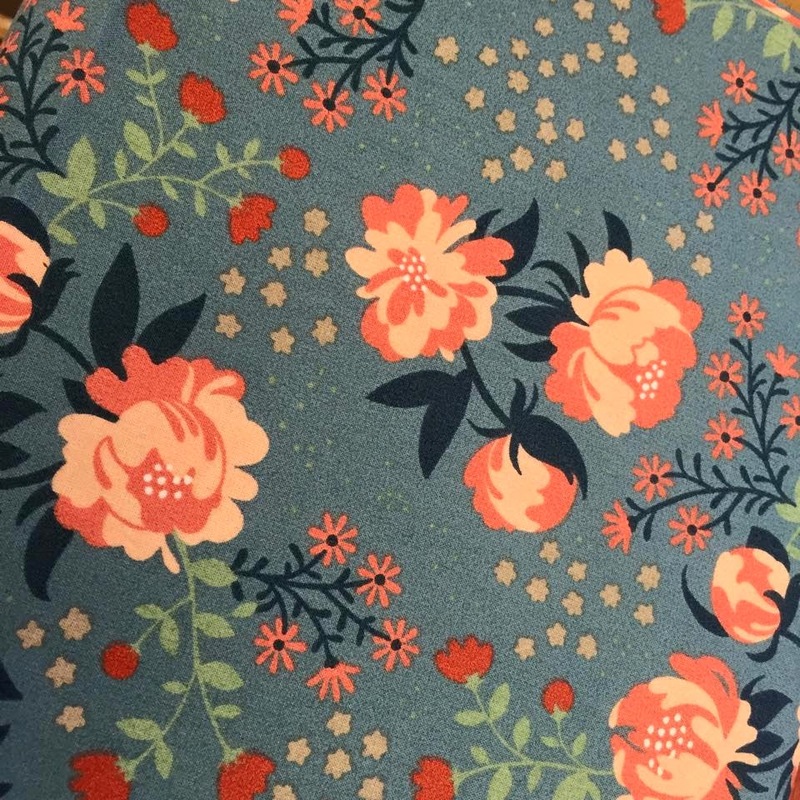 Peonies Blue, love this print! 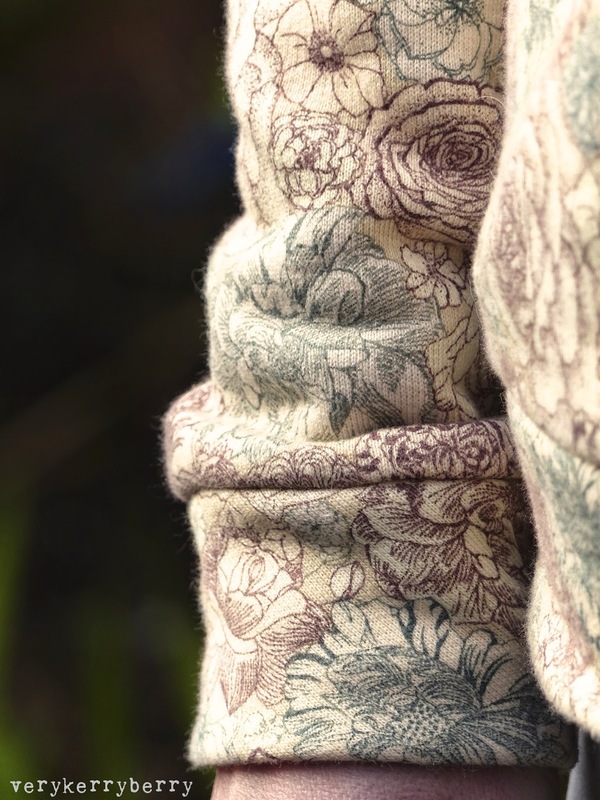 On the website, a lot of the images are digital rather than photographs of the actual fabric but you can see the difference with these pictures from Eternal Maker's Facebook page, the colours are deeper and richer. 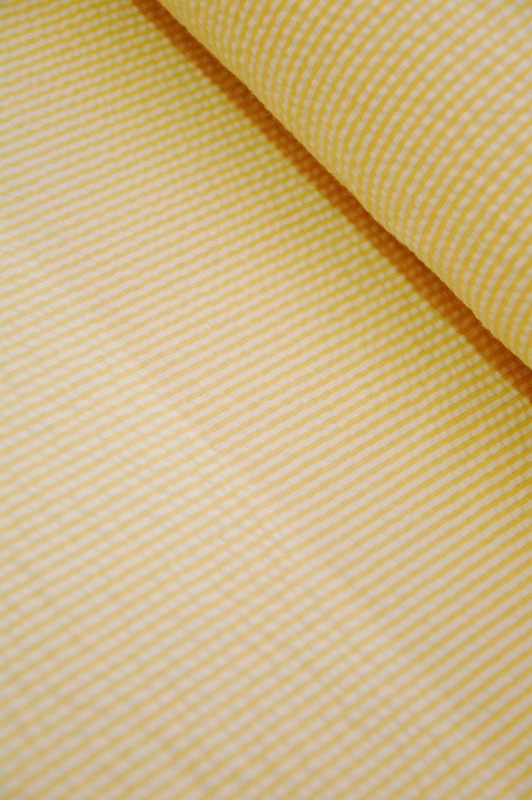 Seersucker is a quintessential summer fabric and there is a great choice of Robert Kaufman seersucker fabrics from ginghams like this one in hot pink, to stripes- this is lemon. All the seer suckers are 57"/145cm wide and a 55% combed cotton 45% poly blend. 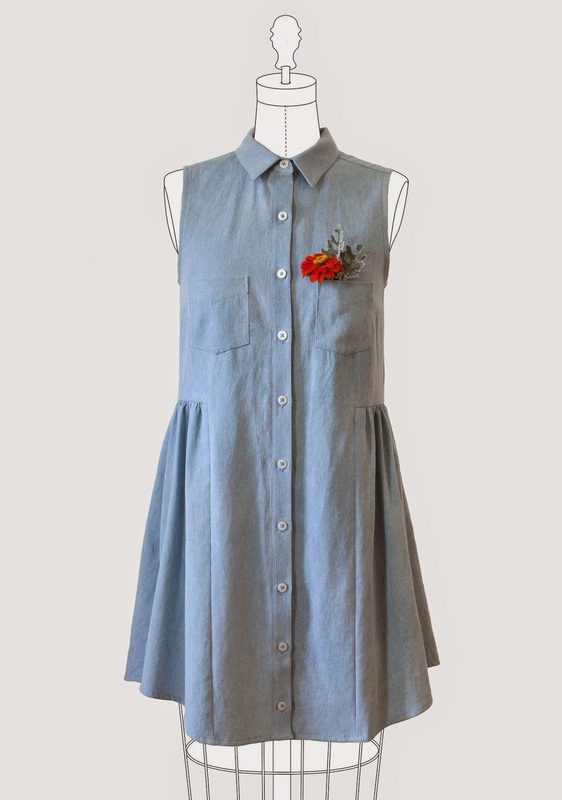 Personally, I would love to see the Lobsters as the Grainline Alder dress- Grainline patterns have just arrived at Eternal Maker. 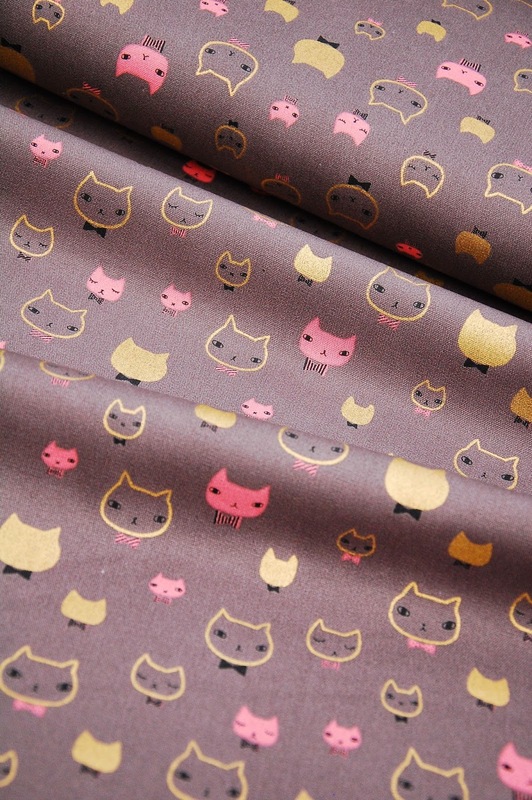 To finish with, I like to keep an eye on the Japanese import fabrics in stock and I found this cute cat metallic print that I hadn't seen before. 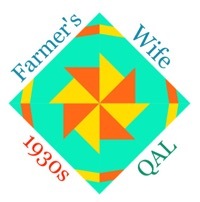 I went to the Southwest Quilt festival a few weeks ago and a kit caught my eye and gave me an idea. Cool Crafting had a stall packed full of well presented toy kits for dolls, rabbits and foxes plus their accessories. 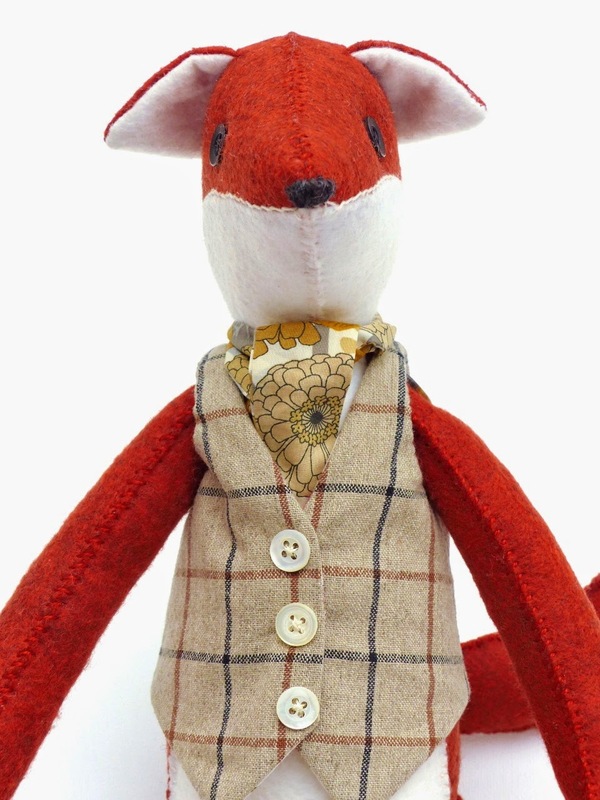 This is from the Reynard the fox kit; the cravat and waistcoat were my own addition. 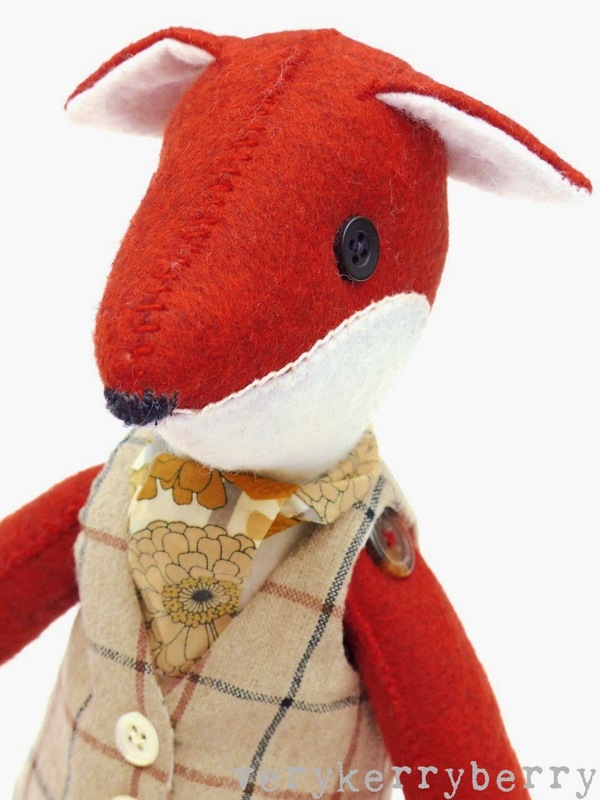 The construction is well explained and with the exception of the ears, sewn by hand. The kit includes buttons for joints, thread- I found the black embroidery floss was rather weak so substituted with some perle cotton. It also included stuffing but I ran out near then end so I dipped into my own supplies. The Liberty feet in Arrow B were my own addition, as was the linen waistcoat, a self drafted pattern and lined with a pink floral Liberty lawn and co-ordinating cravat. Any questions please ask in comments or email me. Postage in the UK is £2.80 per selection. 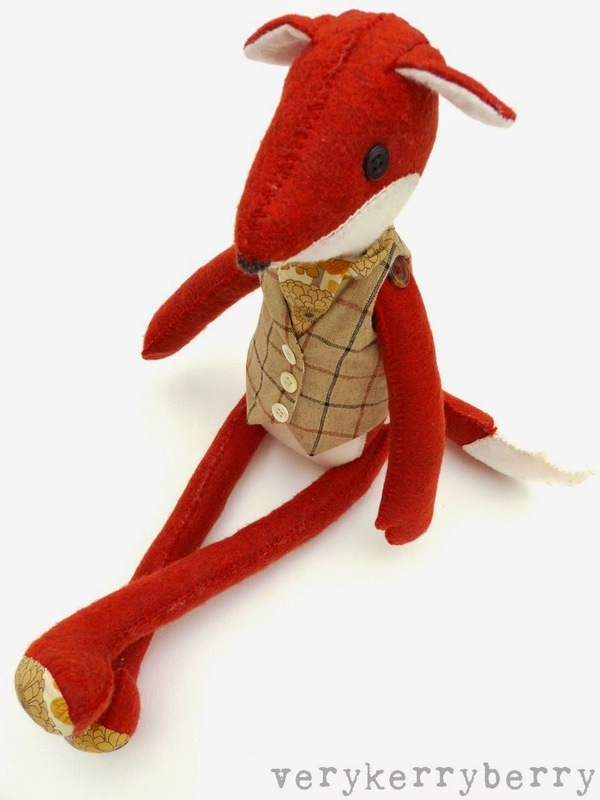 If you buy more than one selection, I can combine items often at no extra postage cost. Overseas postage is expensive so I am thinking of UK readers, but if you are overseas and prepared to pay I am happy to sell. Email me if you are interested in buying any of these selections. 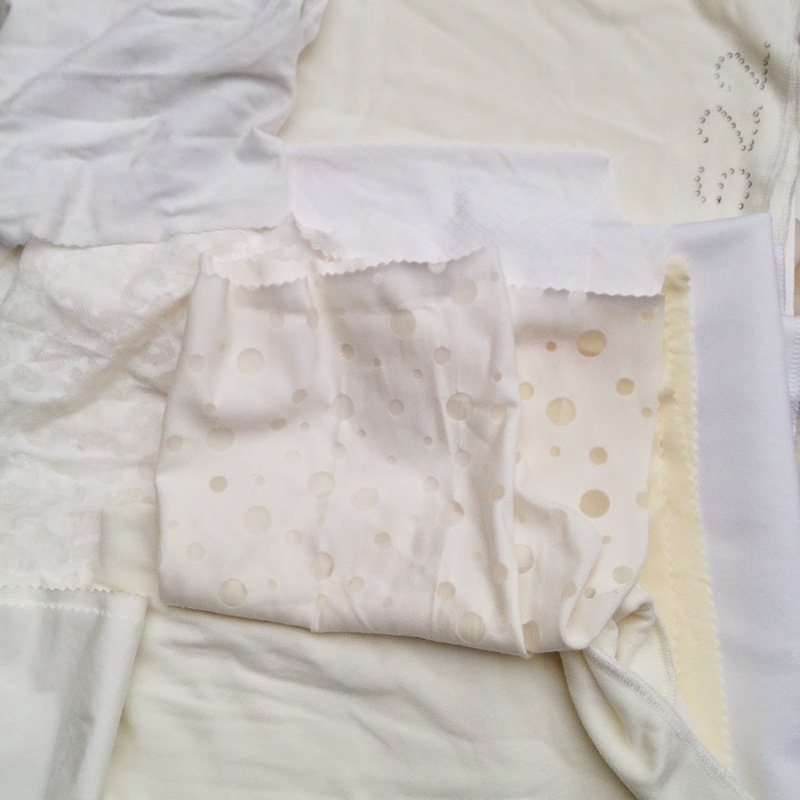 Nice fabric pieces in cream and white: mix of cotton jersey, nylon/lycra, nylon/lycra jacquard, polymide spandex. £5 plus postage. Specialist padding and lining fabrics. 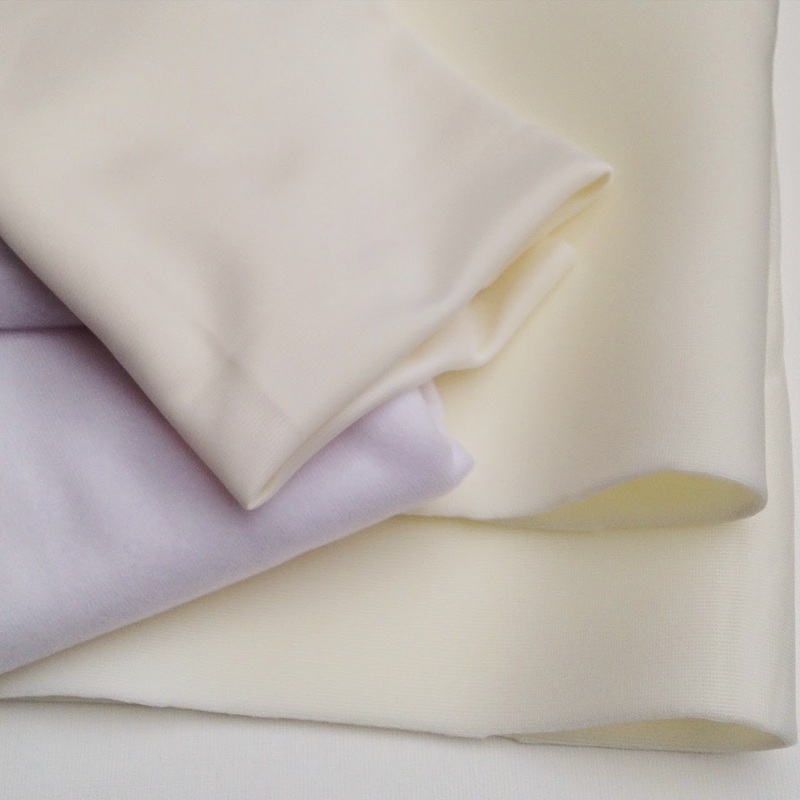 From top left- rigid heavy cream tricot, suitable for cradle or cups 50 x 75cm, bra lining fleece, plush on one side for softness or when you want a thicker layer but no padding for cups or cradle- two pieces of this in white, each measuring 60 x 78cm, bra cup foam padding in cream, light weight 63 x 72cm. £10 plus postage. 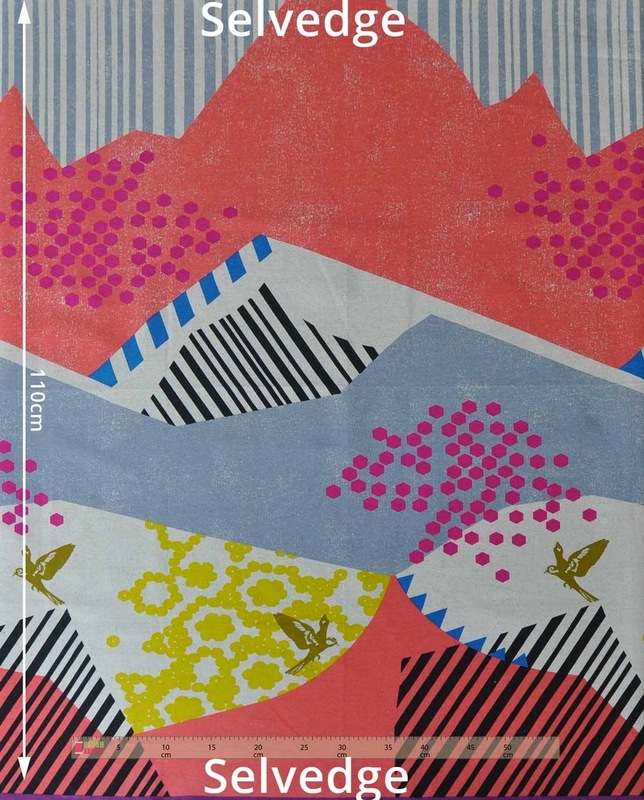 Riley Blake 'Roots and Wings' is a new arrival and has some bright lively floral prints. 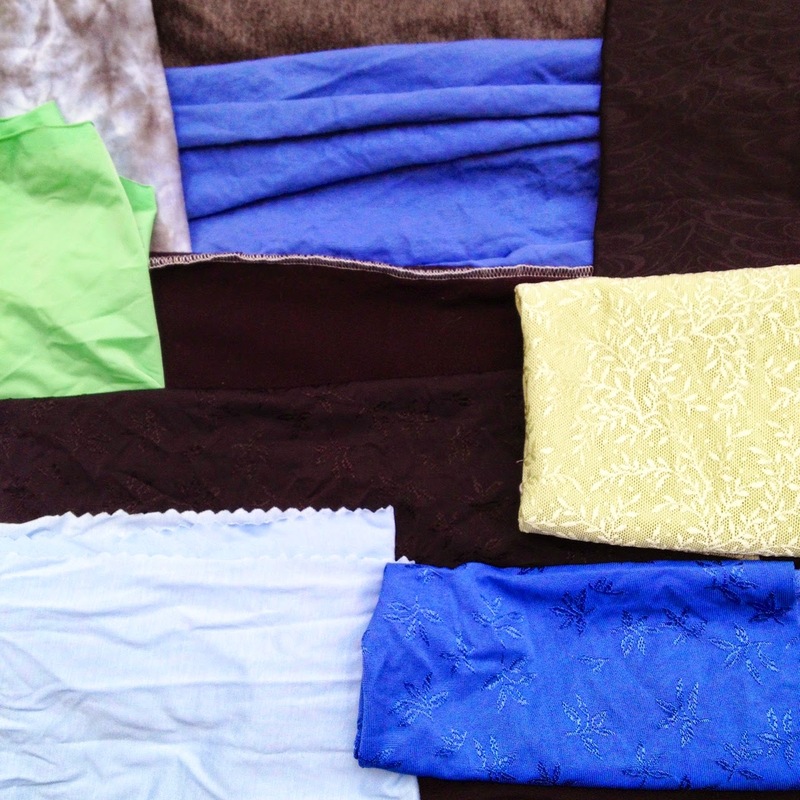 The bundle also includes some co-ordinating Kona cotton solids. 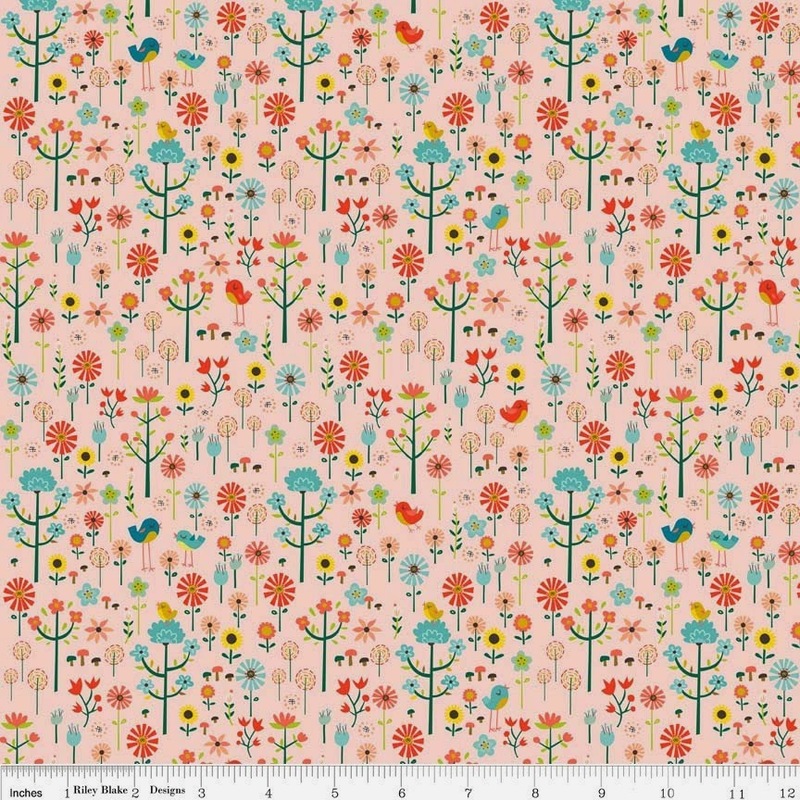 I especially like the Garden coral fabric, available separate from the bundle, a lovely blush colour. I've mentioned Sweetwater's new Feed Company range as part of the Fat Quarter Shop blogger bundle that I put together for April. 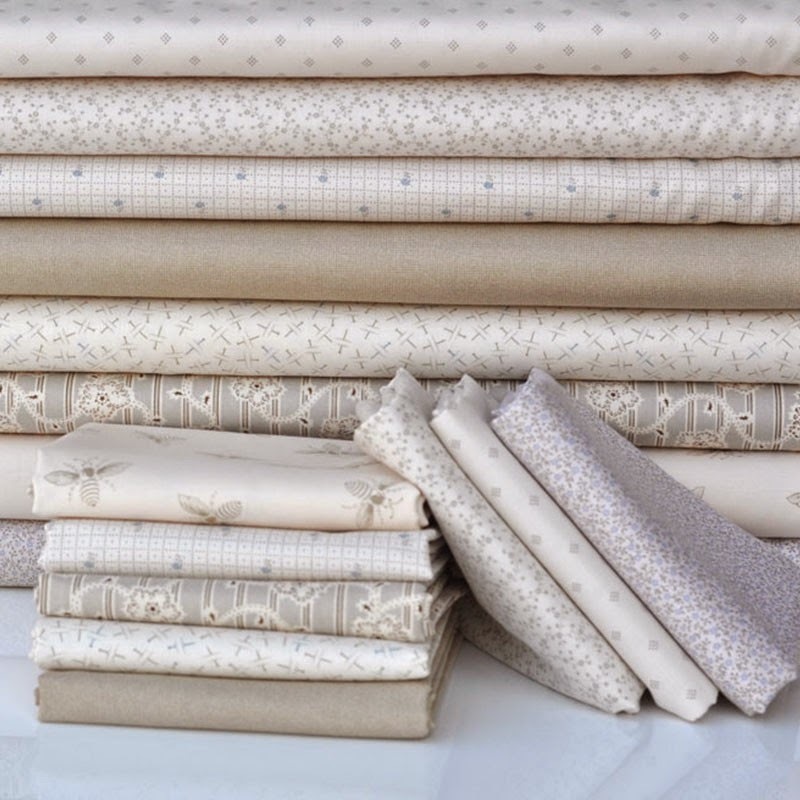 Plush Addict have a Feed Company bundle which includes a selection of the Sweetwater fabrics along with some solids. It includes my favourite print from this collection, Church Cookbook Recipes in multi (top of the bundle stack) and I've already bought some of this! 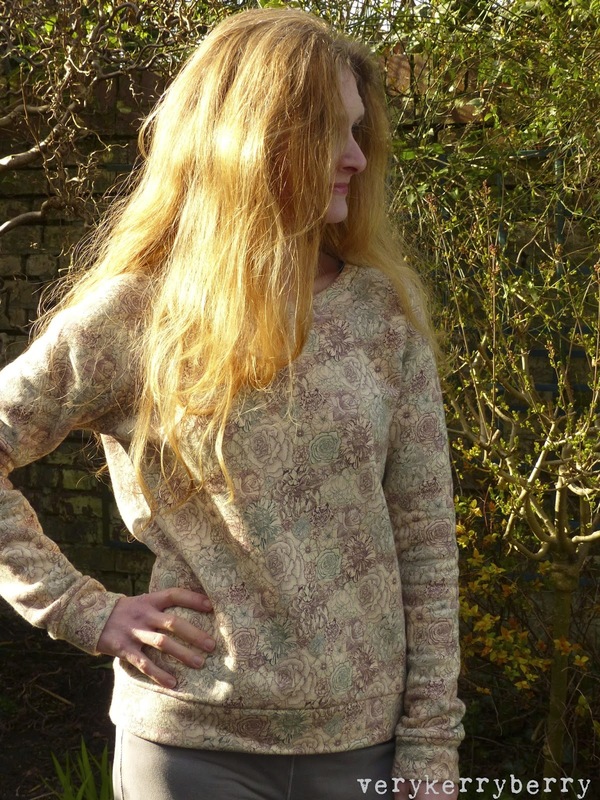 Wanderer is April Rhodes latest collection for Art Gallery and her best yet. 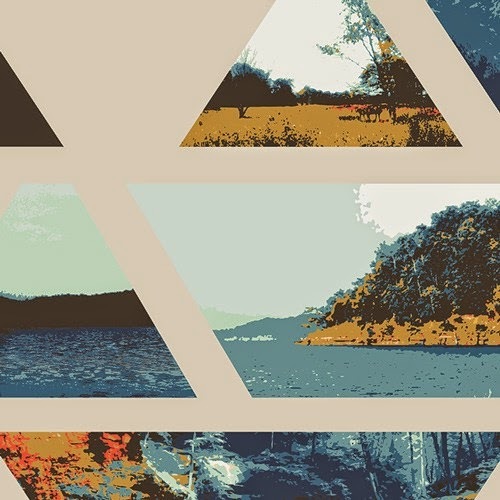 Stunning colours and a mix of geometrics, photographs and delicate nature themed prints, it really is a fantastic range. 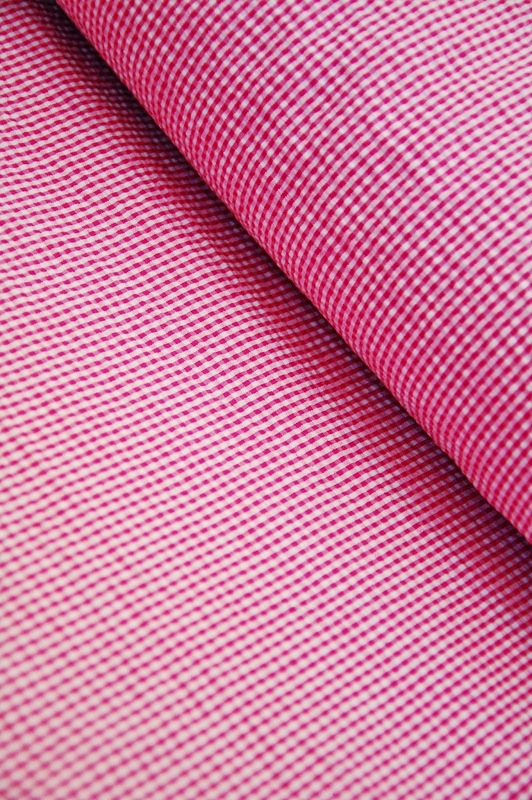 Plus Art Gallery cottons are super quality, finer and smoother than standard quilting cottons and great for dressmaking too. 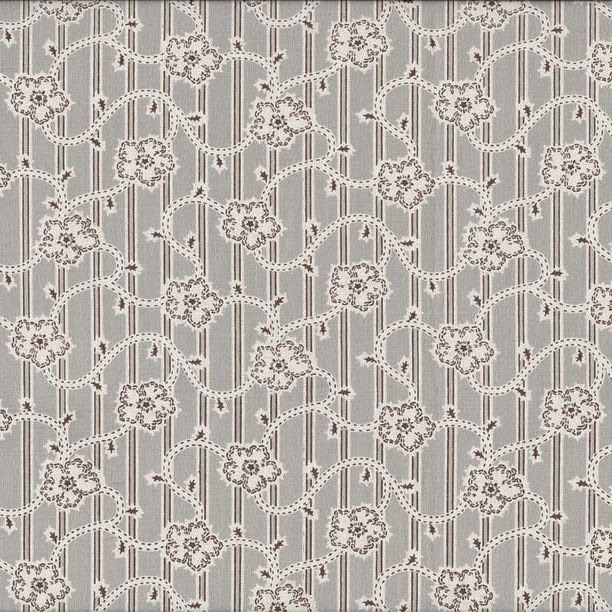 Linen Closet is a traditional low volume collection of delicate pale prints from Makower. I have a lot of these prints- I think it was Lynne who first put me on to them. 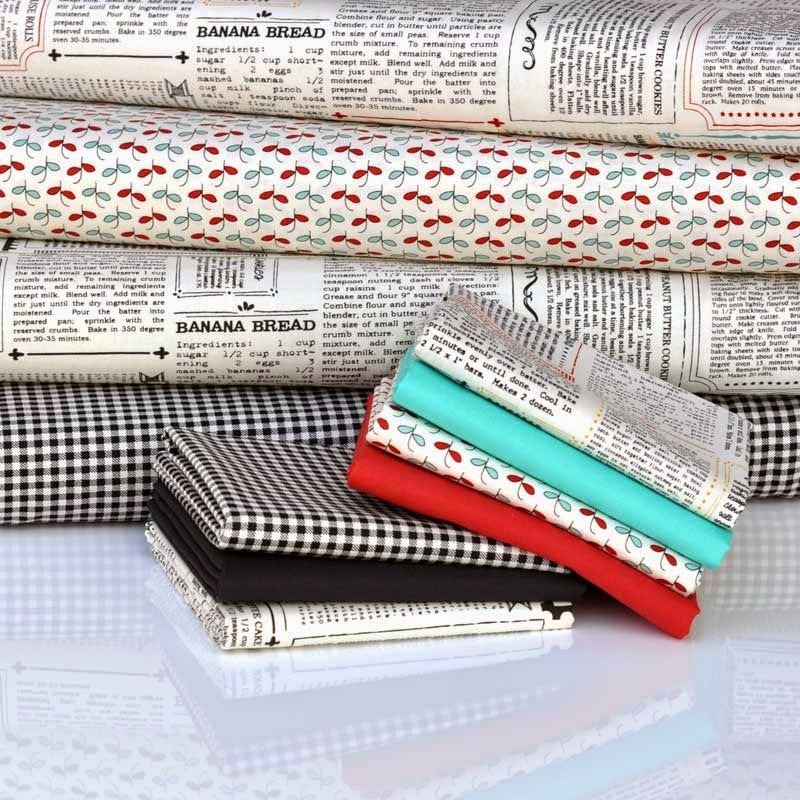 They are great background fabrics and work well with modern prints as well as traditional. I am using some of these in my Bring Me Flowers quilt at the moment. 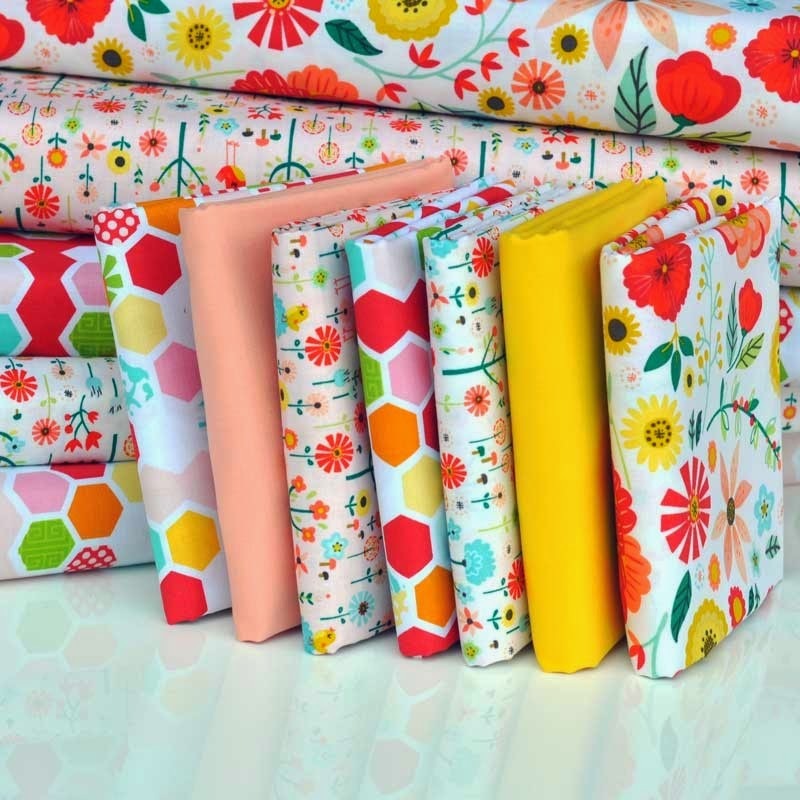 Blossom stripe is the stand out print for me but they are all good! 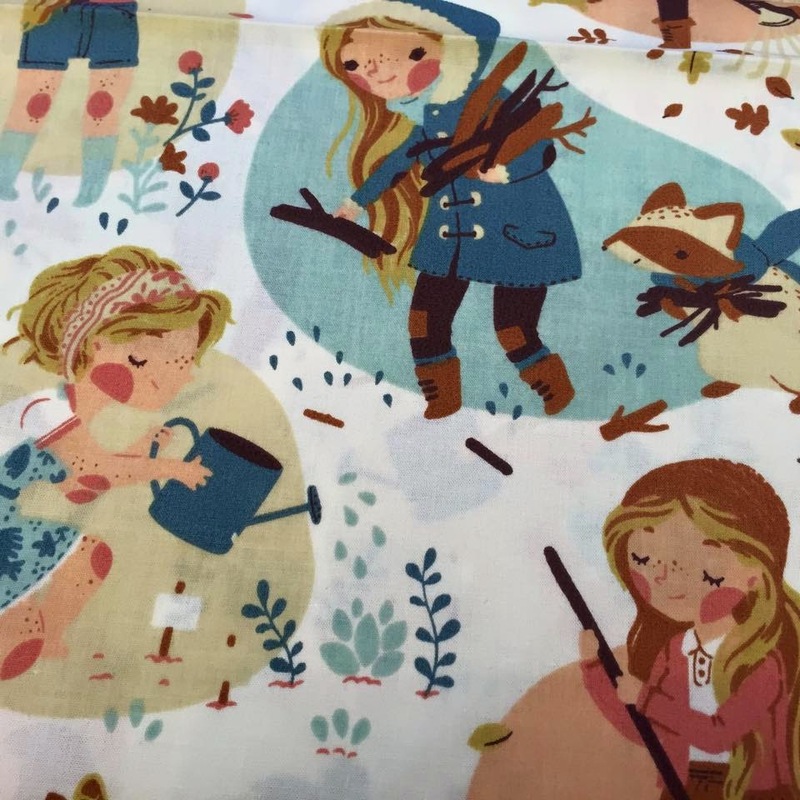 Great for skirts, bags, dresses, cushions as well as quilting and what a print! All other Echino prints are included in the flash sale- check out the others here. With some products, the discount appears once the item is in your basket. If any products look like their discount hasn't been applies, Email Kellie if in doubt. Do you follow Plush Addict on twitter? Even if you are not a great fan of tweeting it is worth following their feed to catch the latest discounts and flash sales. You've probably seen this sweatshirt somewhere before? 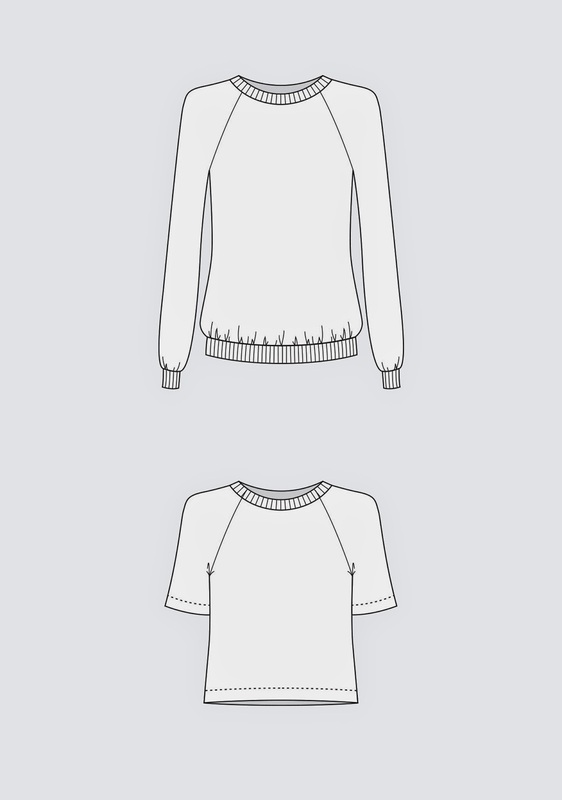 Linden sweatshirts have been all over the sewing blogs the last few months. It's a Grainline pattern designed by Jen Beeman. I've made her Alder dress, actually I made two and it was one of my favourite patterns of last summer. Because of lack of stretch in this knit, I cut the cuffs on the bias (as recommended by Jen and also used by Karyn) in cut them slightly bigger at a size 4. The alternative is to use ribbing. Seam allowances are narrow at ¼". 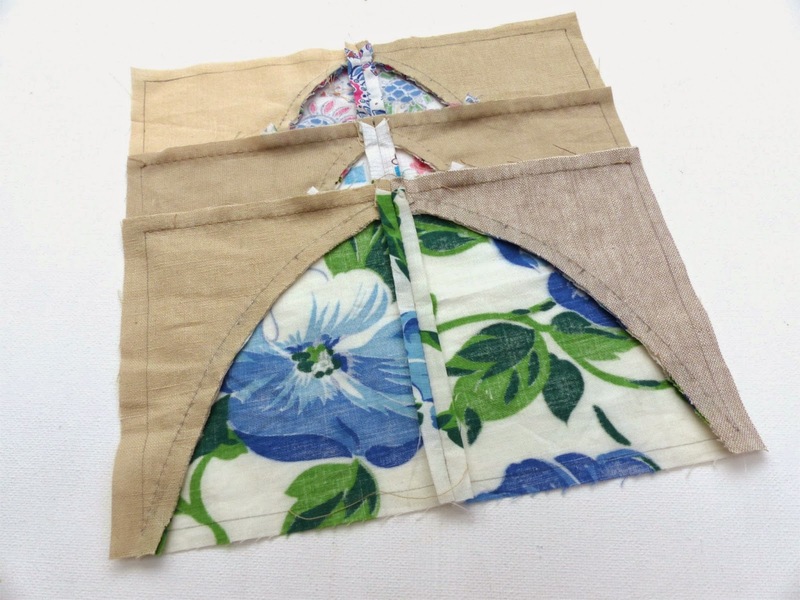 You could always add a little extra to make for a bigger seam allowance if that is more comfortable for you. I used my overlocker/serger throughout. I did baste the the neck binding with long machine straight stitch and top stitched this area too. A few months ago, Lindsay from Zakka Workshop got in touch asking if I would like to try some Yoshiko Jinzenji patterns they were launching. 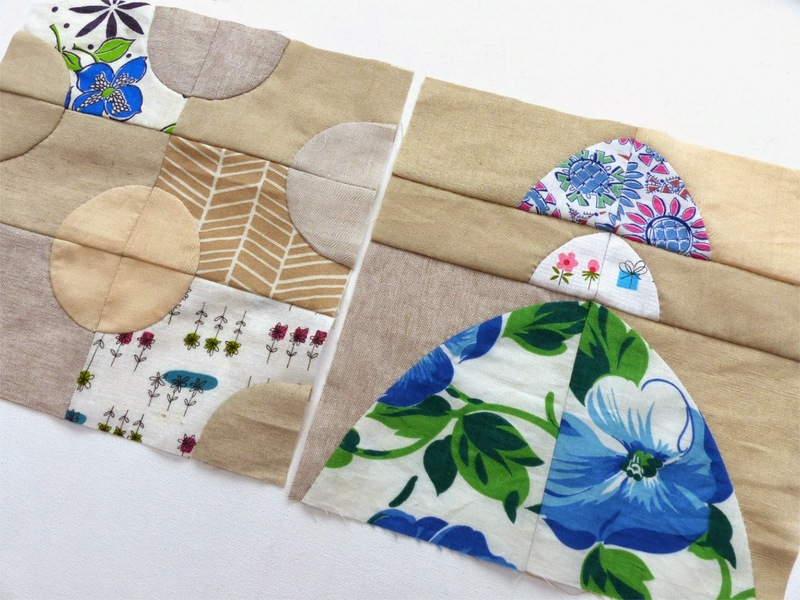 They are projects from her book Quilting Line and Colour. 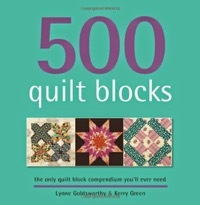 I haven't got the book and it is now out of print and rather expensive to get hold of so I chose The Modern Sampler Quilt and Lindsay generously included some other patterns too. The patterns are in booklet form, all pattern pieces or templates are included full size on a separate sheet. I assume that as the book is now not available, patterns like this provide more efficient alternative to a fresh print run whilst making the author's work more accessible and providing royalties. It's a great idea if you are limited for space- I have lots of books that I keep for the one project I might make. Buying a booklet like this reminds me of buying a single download instead of an album. Efficient, cost effective but you might miss out on the joy of the whole book. 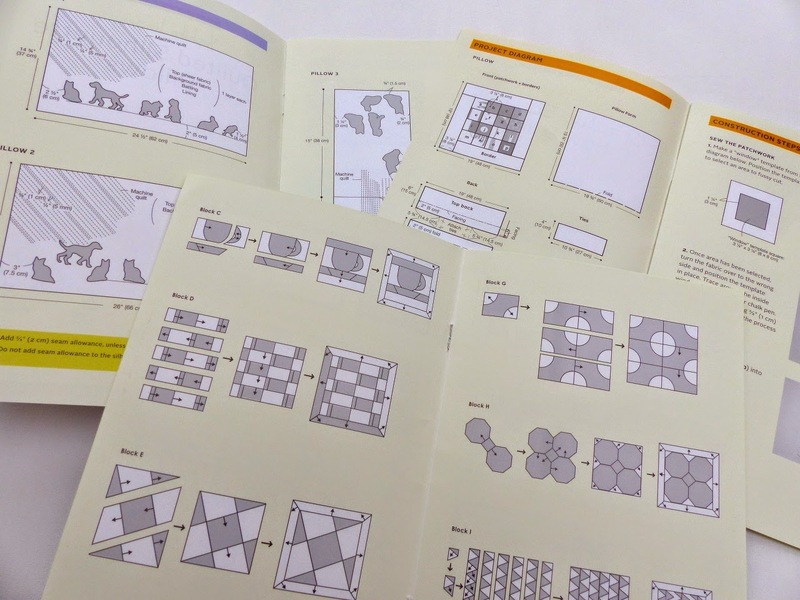 In all three patterns, the instructions involve a lot of detailed diagrams- this suits my learning style; plus text and photographs. Yoshiko Jinzenji's style is clean, minimal, organic and modern. The patterns are described as 'Japanese Quilt Artist Series' and they definitely lean towards the textile art side of quilting. 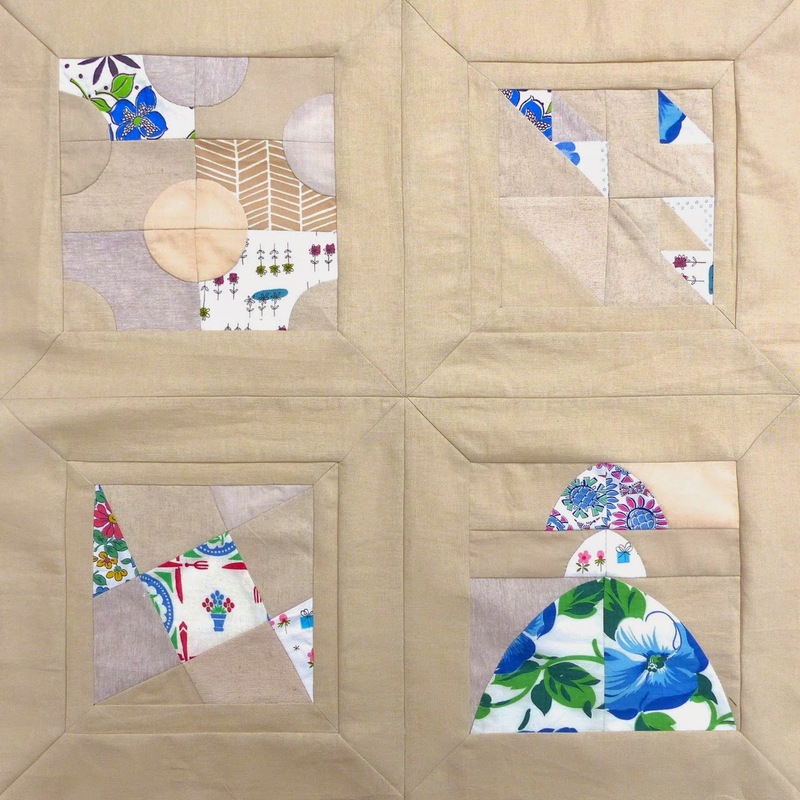 I chose four of the blocks in the modern sampler quilt. 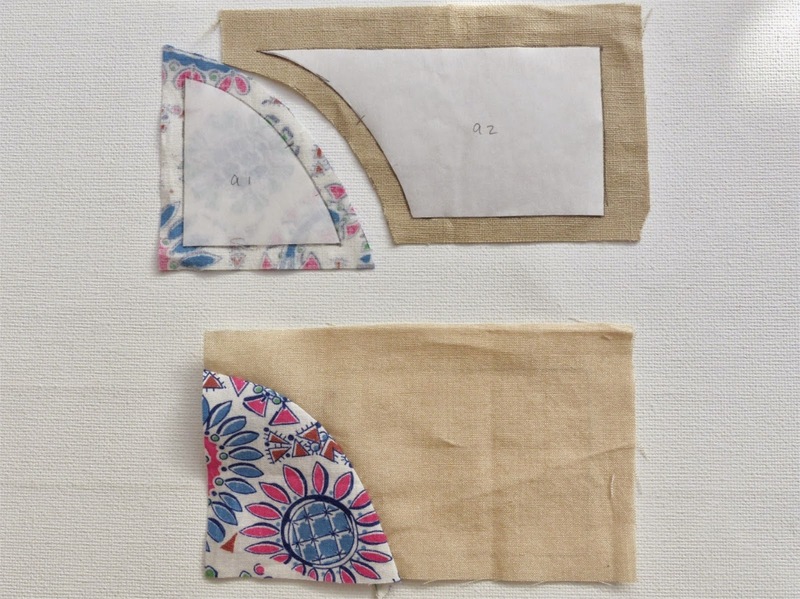 For the blocks that included curves, I traced the block templates onto freezer paper, ironed them onto the reverse of the fabric, drew round them in pencil and added seam allowance all round. 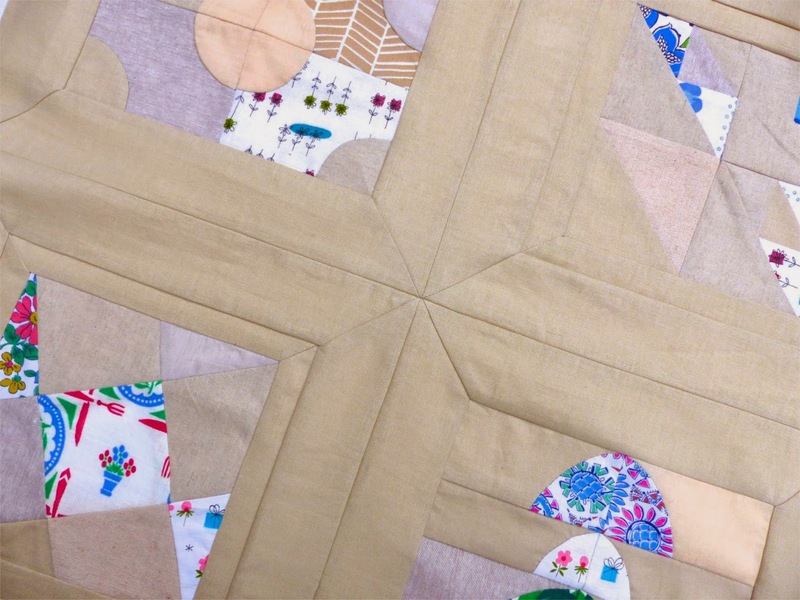 I hand pieced the curved blocks and this method is shown in detail in the pattern. They could be machined but I am enjoying hand piecing at the moment and I thought I would get better results. I used a selection of linens and cottons for my neutral background and vintage prints for my quiet bursts of colour. You can see more of the construction on the reverse. For the square and triangle blocks, I departed from the instructions, traced the blocks onto thin paper and foundation pieced the blocks. 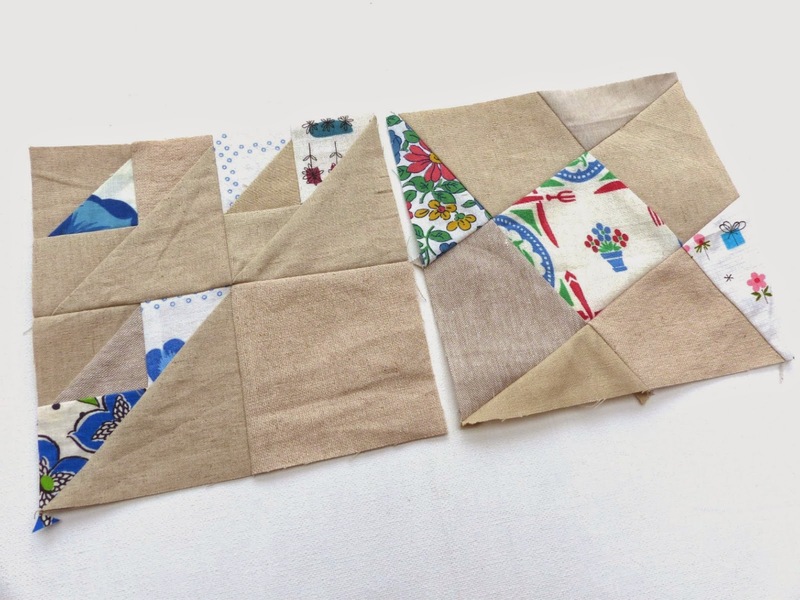 Each block has mitred border pieces which are a bit of a pain to trace- there are four as the angles have slight variations, but they sew together beautifully using Y seams. These were sewn by machine. See my tutorial for this technique here. I am now at a large cushion cover size but I think I need to add more details to it. 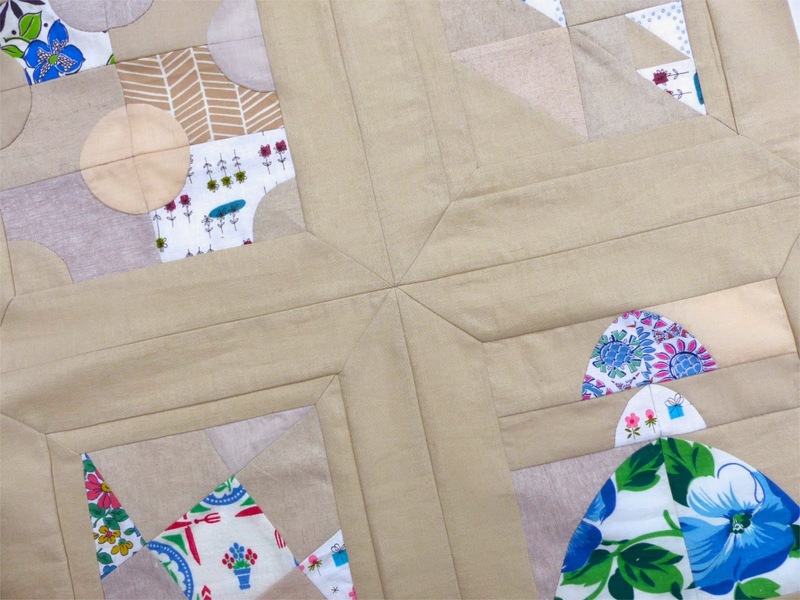 The pattern includes appliqué irregular strips that are sewn on by hand using needle turn technique and I fancy adding some strips to the centre cross. 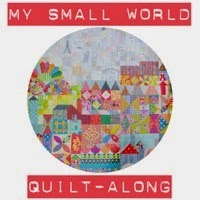 I love this pattern, it was a calming and pleasing make and I would like to return to and make the whole quilt. It's a slow burner project that I keep returning to as other sewing comes and goes. 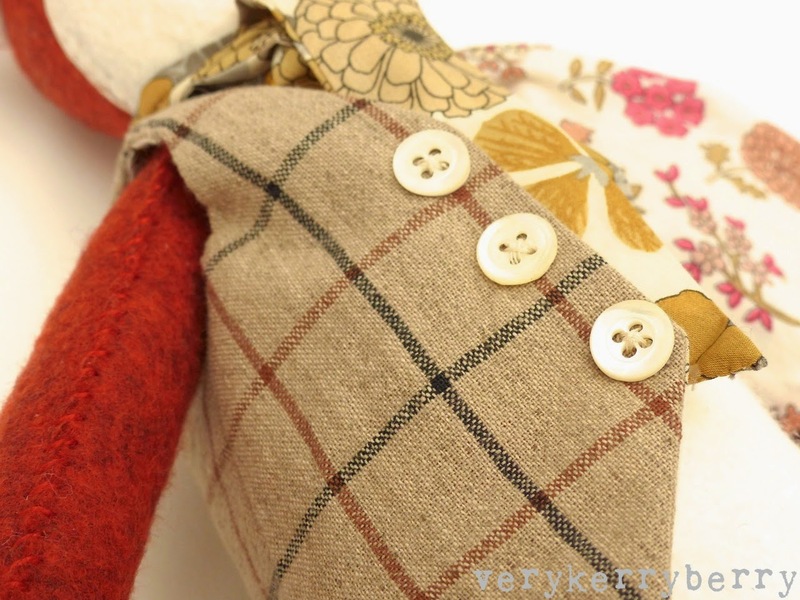 You can find the patterns at Zakka Workshop and in their Etsy shop. 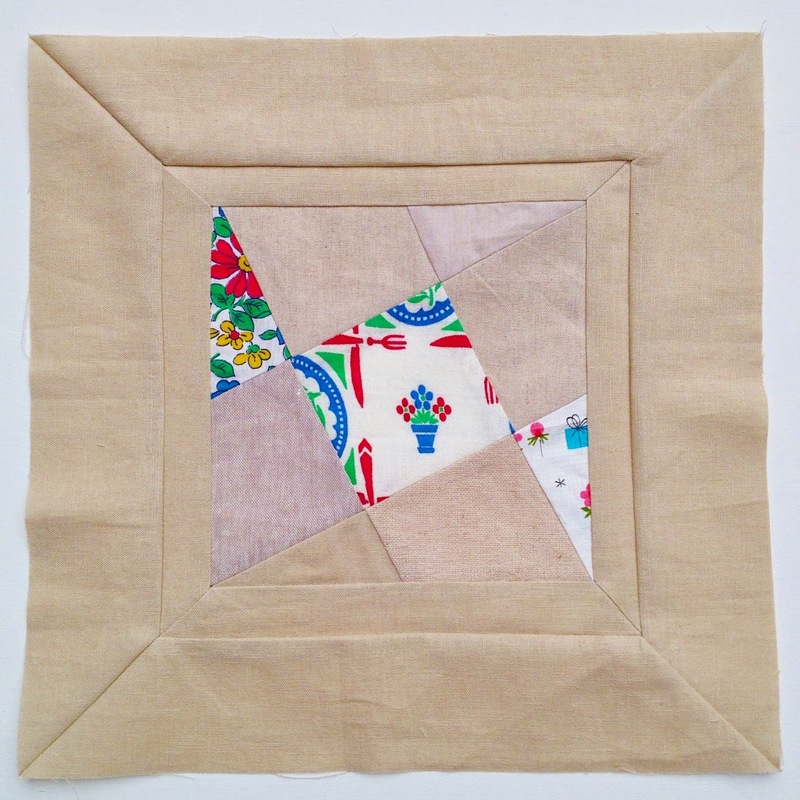 The Modern Sampler Quilt is quite an advanced skill level. 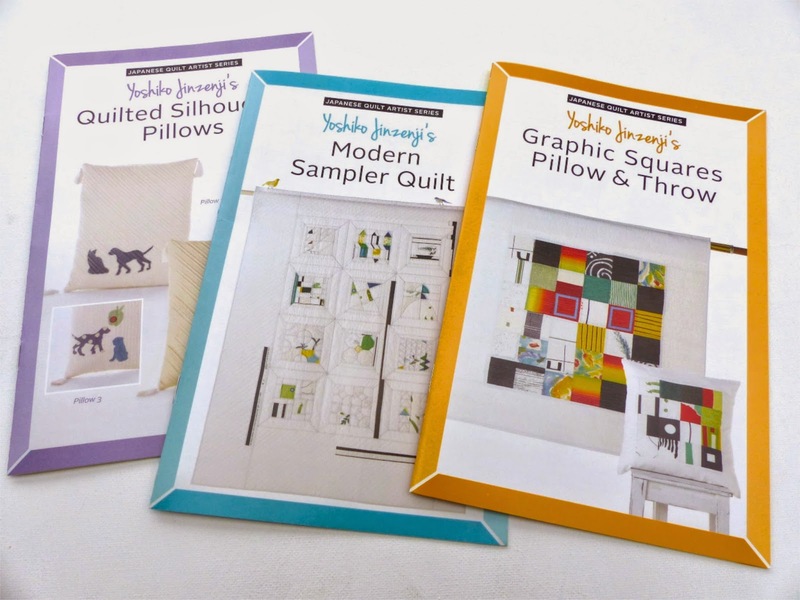 The Graphic Squares Pillow and Throw pattern is a beginner project- covering a 16 patch cushion layout and fussy cutting in lots of photo graphics step-by step-detail and the Quilted Silhouette Pillows are a simple raw edge appliqué project. What are your thoughts on this sort of pattern production- extracting projects from books and selling then as independent products? I wonder if it is something we will see more of?